Oregon is renowned for its natural beauty, outdoor recreation opportunities and especially its forests. Natural resources are also an important part of our economy. 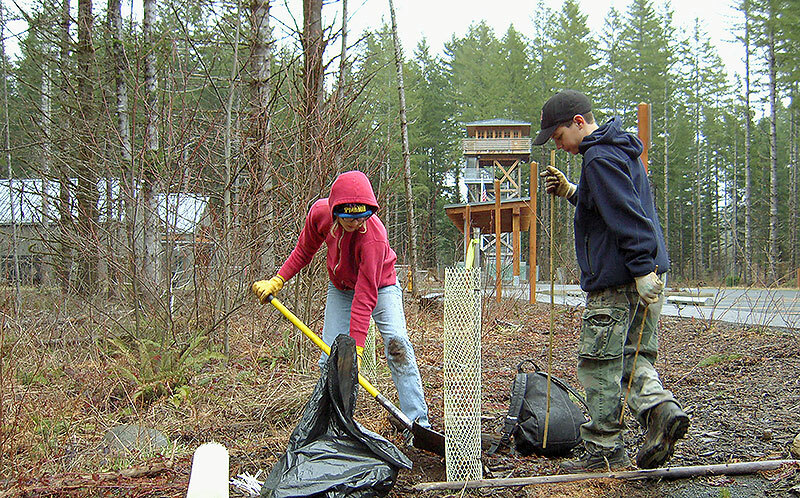 Approximately 61,000 Oregonians are employed in the state's forest sector. They have an array of forest-related jobs, including positions in forestry, logging, trucking, milling, engineering, hydrology, business management and academic research. If you're among Oregon's forest-sector workers, you're in good company. Forest professionals care for our forests, conserve fish and wildlife habitat, protect water, sustain forests for future generations, and make innovative, environmentally friendly forest products. Want to spread the Forest Proud message in your company or organization? Employers can use the Forest Proud toolkit to request free educational materials that reinforce key reasons their employees should be proud to work in the forest sector. Oregon contains nearly 30 million acres of forestland. That’s almost half the state. We depend on our vast forests in many ways. They supply the timber we use to make lumber, paper and heat. Forests filter our drinking water. Countless plants and animals call forests home. They’re great places to hike, fish, hunt or camp. Oregon’s forests have many different owners. This includes the federal and state government, timber companies and families. These landowners care for our forests. Their work helps preserve all the ways forests make our lives better. Oregon law requires forest landowners to plant trees after harvesting timber. This means we’ll always have flourishing forests. For forest products companies, it’s not just about following the law - replanting makes sense. It ensures a continued supply of logs for making wood products as well as habitat for a variety of animals, and creates a beautiful, mosaic landscape. Every year, 40 million new trees are planted in Oregon’s forests. And far more trees are planted than are harvested. In Oregon, we make sustainable wood products. That’s because they’re made from trees – a renewable resource that can be harvested, planted and grown over and over. Oregon wood comes from forests where landowners are required to replant trees after harvesting timber. They must also protect fish and wildlife habitat as well as drinking water. That’s thanks to the Oregon Forest Practices Act. The state law contains nearly 300 rules that require forest landowners to use sustainable practices. By sustaining Oregon’s forests, we’ll continue to enjoy high-quality water as well as wood houses, apartments and office buildings into the future – plus hiking, hunting and fishing in the woods for generations. Technology has improved each step of making Oregon forest products. Nurseries are growing healthier seedlings. Computer mapping aids foresters caring for forests. Modern logging is both high-tech and low-impact on the environment. Mills use computer scans to maximize the value of each log. All these advances help make our forests and the products that come from them more sustainable. Thanks to innovation, we can now build skyscrapers out of wood. A number of Oregon companies make engineered “mass timber” building products that are strong enough to build larger and taller with wood. Mass timber buildings are beautiful. They’re also just as safe as traditional structures in a fire or earthquake. Oregon is leading the way with innovative uses of wood. More and more offices, condominiums and other mid-size to tall buildings are being built with wood, which helps support our local mills. In 1971, Oregon became the first state to pass a forest practices law. By regulating logging and other forest work, it helps protect our drinking water as well as fish and wildlife habitat. Forest landowners support the Oregon Forest Practices Act and carefully follow its rules. Those who don’t face consequences. Regular monitoring by the Oregon Department of Forestry shows that landowners comply with the law more than 97 percent of the time. The forest practices rules are continually updated to keep pace with advances in forest science. Forests are home to many different kinds of wildlife. That’s why protecting animals and fish is an important part of working in Oregon’s forests. State law requires Oregon forest landowners to conserve wildlife habitat. Landowners often go beyond these requirements. They hire wildlife biologists to make sure timber harvests don’t harm fish, birds and other critters. In addition, many have volunteered to improve streams for fish. Safe drinking water is a basic necessity. Forest landowners are careful to protect it for all of us. Most of Oregon’s drinking water comes from forests, including forests that produce wood. Landowners and timber companies take precautions to safeguard water sources, such as preventing chemicals and muddy runoff from getting into streams. As a result, Oregon’s water quality is among the highest in the nation. To make wood products, you need a sustainable timber supply. That means forest landowners and timber companies must harvest timber responsibly. Each year, Oregon landowners typically harvest timber from just a small portion of their properties. They also plant more trees than they harvest. These responsible practices have paid off. Forests in Oregon are plentiful. In fact, the state's total forestland has held at about 30 million acres for more than 60 years. Newly planted trees must outgrow the weeds and brush around them to survive their first few years. That’s why some forest landowners use herbicides, as safely and sparingly as possible. Herbicides keep weeds and brush in check. This gives seedlings a head start to grow into a new forest. Herbicides are usually only needed in the first few years of tree growth. Throughout Oregon, forest herbicides account for just 4 percent of all chemicals used for timber and agriculture production. Oregon’s forest workers are at the front line of preventing and fighting wildfires. Because they work in the forest, they can be the first to respond when a fire starts. They also help prevent wildfires by taking special precautions during fire season. Private forest landowners, loggers and timber company employees work with firefighters to prevent and fight fires. Together, they're helping keep Oregon green. Wood from Oregon’s forests is used to make thousands of products we use every day. Locally made wood products are beautiful and durable, and require relatively little energy to produce. They’re also reusable and recyclable. Making wood products is part of Oregon’s identity, heritage and culture. Our state has long been the top producer of softwood lumber and plywood in the United States. Join the Forest Proud community on Facebook @ForestProudOregon. Joining a trade association, getting more informed and volunteering are among the ways you can help promote and educate about Oregon's forest sector, as well as connect with others who are passionate about our forests. Explore forest careers with the Find Your Path video series. Learn more about the Oregon Forest Practices Act with the A Day in the Woods video series. Visit Oregon Forest Facts for the latest data about Oregon’s forests and forest sector. 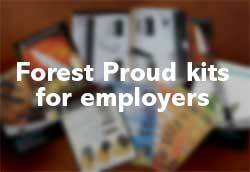 Forest sector employers can order a Forest Proud communications kit for their workforce. It's FREE. Get yours today!